ELIZABETH STUCKEY-FRENCH is the author of the novel "Mermaids on the Moon" and the short story collection "The First Paper Girl in Red Oak, Iowa." She lives in Tallahassee, Florida, where she teaches fiction writing at Florida State University. "Elizabeth Stuckey-French's latest novel is playfully retro...We don't expect, in comic little-old-lady novels, to encounter childhood cancer, randy preachers and a boy building a homemade breeder reactor in the tool shed. But Stuckey-French knows that if you dig deep enough, we're all oddballs, and the the world is a perilous and unpredictable place." "[A] charmingly off-kilter novel...Stuckey-French channels her characters -- including two mildly autistic teenagers -- with precision and wit, weaving in wry insights about modern suburban life. The result is a smart and improbably cheerful tale about family that's actually quite sweet at its core." 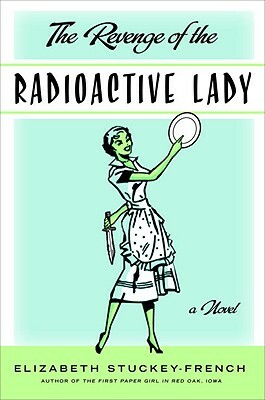 "[The Revenge of the Radioactive Lady] turns out to be the best kind of page-turner -- one with heart." "Mixing the suburban angst of Tom Perrotta with the snarky humor of Carl Hiaasen, Stuckey-French has written a page-turner that is thoughtful, amusing, and nearly impossible to put down." "The Revenge of the Radioactive Lady is surprisingly chipper as the neurotic and lovable cast turns a macabre tale into a wildly compulsive read." "It's impossible not to love a novel that starts out with a 77-year-old woman planning cold-blooded murder, especially when the old lady in question is as charming and funny as Stuckey-French's Marylou Ahearn. As she steadily worms her way into the world and family of her intended victim, this fast-paced and witty book expands to create a big-hearted, hilarious and touching portrait of a community full of an amazing and vivid cast of characters. A true pleasure to read." --Dan Chaon, bestselling author of Await Your Reply. "Cheeky and cinematic...Fast-paced, vibrant and quirky, this novel will surely win new fans for Stuckey-French." "The Revenge of the Radioactive Lady is a title that could have been used for 1950s-vintage pulp fiction. But modern dilemmas rule Elizabeth Stuckey-French's darkly funny novel that manages to deliver some sharp observations on the fruits of venegeance along the way." "The non-fiction bestseller "The Immortal Life of Henrietta Lacks," by Rebecca Skloot, could have been the inspiration for this strangely comic novel about a Memphis woma's desire to murder the doctor who administered radioactive vitamins to her when she was pregnant...One could feel guilt for being so effectively entertained." "An often hilarious, always entertaining novel, but Elizabeth Stuckey-French has achieved much more. With remarkable wisdom and empathy, she has given us a profound meditation on what it means to be a family and the human heart’s complex, sidling path toward forgiveness." "How wonderful it is to find a writer who perfectly captures the spirit of this crazy age: that bizarre and irreducible mix of high and low culture, of tragedy and comedy. This is no mean literary feat. And Elizabeth Stuckey-French achieves it brilliantly. Not only a wildly entertaining novel, an important one." Do you believe that revenge is ever justified, and under what circumstances? To what extent do you sympathize with Marylou’s decision to move to Tallahassee and stalk Wilson Spriggs? What do you think you would have done in her situation? Are there ways in which Otis and Ava’s having Asperger’s Syndrome is similar to the radiation experiment that Marylou experienced? How are the two situations different? Asperger’s Syndrome affects Otis differently than Ava. What do you know about Asperger’s and other neuro-disorders on the autism spectrum? Does the book seem to speak authentically to the ways in which Asperger’s Syndrome affects both boys and girls differently? In what ways do you think Suzi’s problems are a consequence of having two siblings with Asperger’s? What’s the biggest problem in Vic and Caroline’s marriage? What do you think’s going to happen to them? What does it mean to forgive someone? How important is it to forgive, and to be forgiven? What role does religion play in this novel? Quite likely you were surprised by the change in Wilson and Marylou’s relationship, but did you find their relationship believable? Understandable? Why or why not? Why do you think it takes the turn it does? As the novel’s acknowledgements reveal, the radiation experiments in this book are based on actual experiments carried out on U. S. citizens during the Cold War. Do you think such experiments are ever justified? Even if you don’t, how do you think scientists and government officials justified them to themselves? The Revenge of the Radioactive Lady is told from multiple points of view. Though always third-person limited, the point of view shifts from character to character with each chapter. Did you find this technique effective? What does it allow that first-person or third-person omniscient would not have allowed? Stuckey-French is known for her dark humor. Do you find this novel humorous? If so, what parts did you find funniest and what are the sources of the book’s humor?